The Xone:DX. a new plug-and-play DJ controller, is a 20-channel USB soundcard and features total integration of the brand-new 4-deck Serato ITCH software. The Xone:DX boasts the ability to send up to 168 individual MIDI control messages, a 20-channel 96kHz/24-bit USB 2 soundcard, two dual-layer deck simulators and RIAA/phono inputs for external decks, as well as the central 4-channel mixer section that directly manipulates the DSP mixing within the computer. A full version of the new Serato ITCH software is supplied with the DX, providing 4-deck control and a comprehensive set of digital DJ effects, as well as looping and time-stretching. 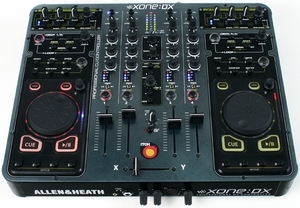 The Xone:DX is also compatible with other leading DJ software brands, and has Allen & Heath�s pro modular design build and high-quality components. It also has bi-color LED feedback layer assignment, UV light-sensitive legend, mix outputs on RCA and balanced XLR, a separate booth output and measures 50mm deep to fit in a laptop bag.